Our Plant Health Care Specialists will design a program that is right for your ornamental trees, shrubs and budget. Our plant feeding program uses an organic liquid fertilizer to supply nutrients, minerals, and amino acids to help your plants thrive. This supports the overall health of the plant as well as flower and fruit growth and helps them to withstand environmental stress. The treatment also provides organic matter and beneficial microorganisms to support a healthy soil environment for your plants to live in, an important part of keeping them happy! Plants are typically fed in the spring to support them during the growing season and again in the fall. This organic fertilizer will not attract animal pests to your property when applied. 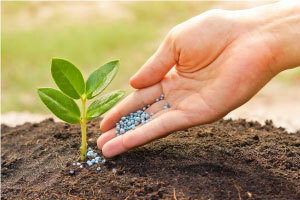 To get started with one of our organic fertilizer programs, contact us for a free consultation and quote.